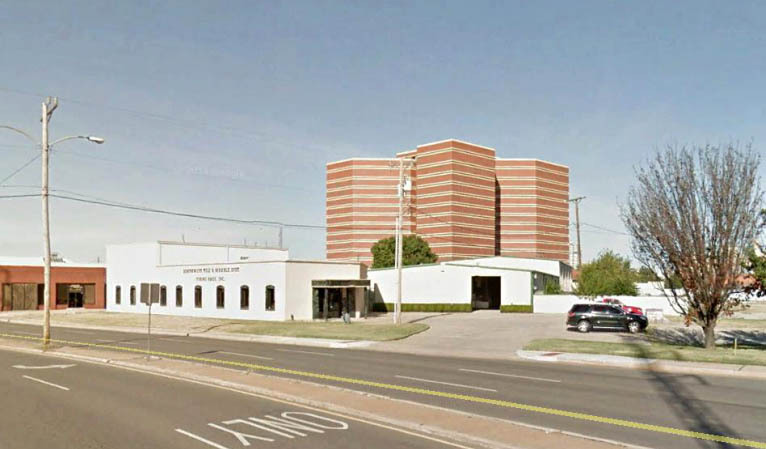 Young Brothers have submitted plans to the city to renovate and expand their facilities near the intersection of NW 1st and Classen Boulevard. Young Brothers sells, fabricates and installs marble, granite and tile products. 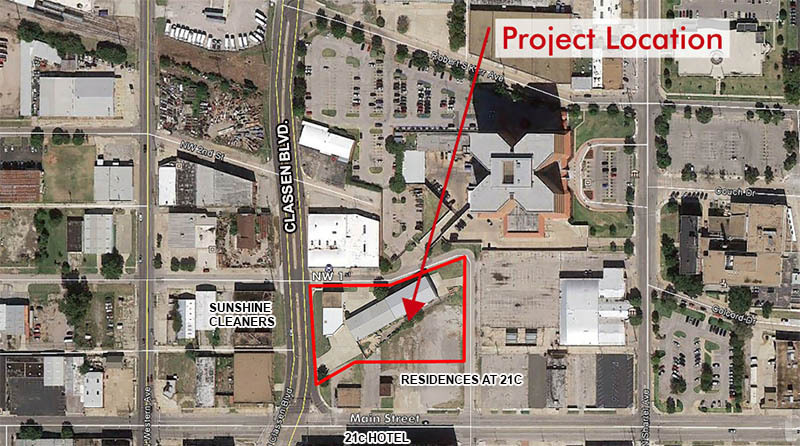 It is yet another development in the booming Film Row and lower Classen Boulevard area which included the 21c Museum Hotel, Residences at 21c, and Sunshine Cleaners projects, all under construction or planned for the immediate area in the near future. Project architect is Rand Elliott. What is written on the top of that angled building? It appears the last word is Granite. 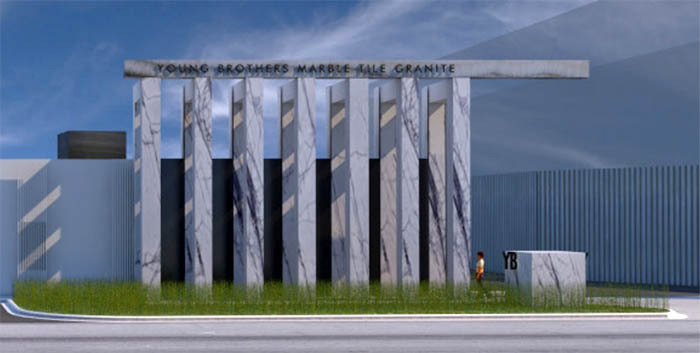 So perhaps it's "Young Brothers Marble And Granite". It's too compressed to tell for sure, though. It looks very Rand Elliottish. I'm not sure it is my preferred use for that location, but it certainly is an improvement. Totally, does he have any different design templates? Honestly, I kinda dig the design. I wouldn't be crushed if the design was changed, but I don't think this design is bad, either. As far as the writing, I suppose I should have said what's on the roof of the angled building shown at the top of the fourth picture. Something that starts with "I saw the..."
They have been at this location a long time. They renovated this building sometime in the last 14-18 years so I am happy to see them keeping up with progress in the area and doing a new remodel. Yes, considering their business type, this is about as good as it gets. Will make a pretty big difference in that area, especially given everything that soon will be happening all around. I like it. Glad to see one of Rand's better projects going downtown. It's hard to steadfastly assert your own personal style, as Rand always does, and still produce a palatable project. This project was approved by the DDRC. 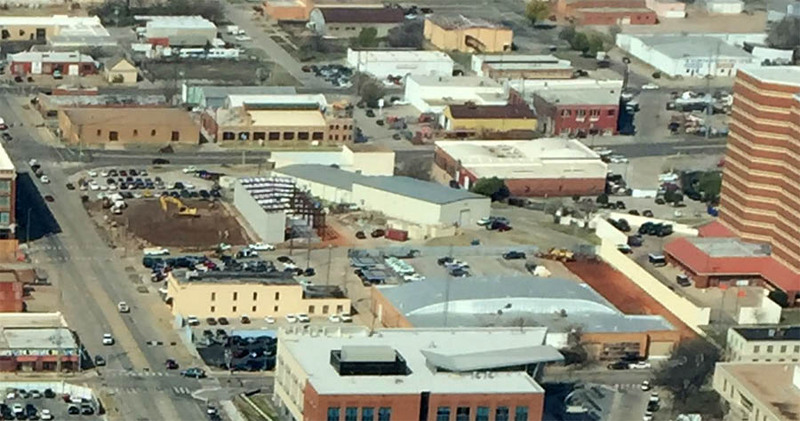 OKLAHOMA CITY – Young Brothers Inc. marble and tile company has been in west downtown since 1969. But a couple of years ago, it considered moving. Vice President Drew Curtis said a developer offered to buy their property at the corner of N. Classen Boulevard and W. Main Street. The company worked with architect Rand Elliott on evaluating the costs to either move or stay. Elliott designed an updated street front and an addition to the office, giving Young Brothers a new look along Classen. With apartments planned along Main, the tall marble design will make a statement, Curtis said. Elliott presented his design Thursday at the Downtown Design Review Commission meeting. He has to return with a landscape plan and will have to get two variances; otherwise, the project was approved. 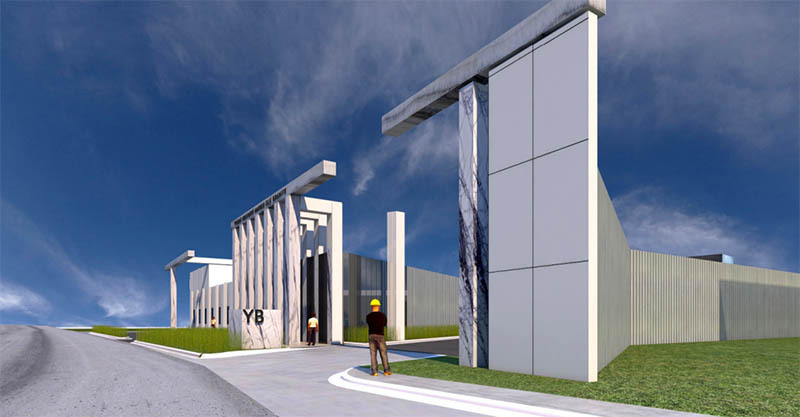 He said his design was inspired by Greece, where marble is a common building material. The front colonnades are a reference to the classical Greek buildings, without completely replicating the historic structures. “We’re not going to build the Parthenon on Classen,” he said during the meeting. Elliott’s design includes a 3,000-square-foot addition to the existing building. Some of the space will be used for offices, and other areas will be used for the showroom. Atop the building, Elliott is planning to paint a quote from Michelangelo: “I saw the angel in the marble and I carved until I set him free.” Elliott said the quote will help the site interact with the apartment tenants and people staying at 21c Museum Hotel. Curtis said the project will break ground in about six months and finish by late 2017. He said the new street presence will stick with people so when they think about putting marble in their house, they’ll know where to go. Photo showing the new warehouse being built in advance of the larger renovation. West Village construction shown directly to the south. Did the design get approved without modifications? The lack of sidewalk fronting Classen is a little concerning. 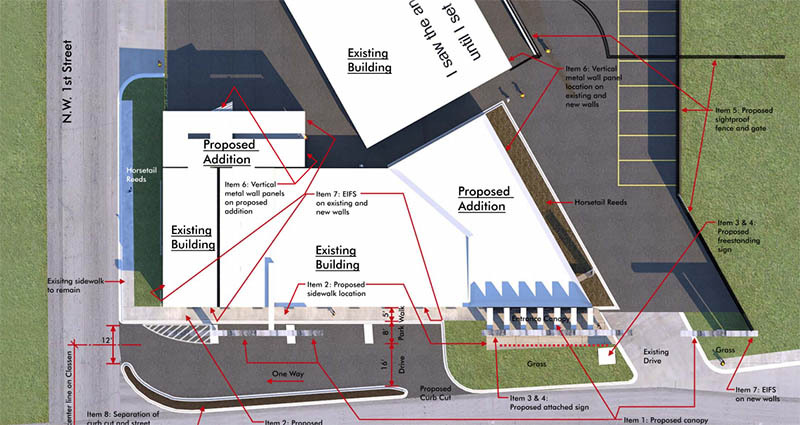 The site plan shows a double sidewalk, one along Classen and one that follows close to the building. The setback of the existing building is pretty large and the proposed site layout addresses this. Maybe I'm misreading them, but I'm not seeing that Classen sidewalk in the renderings as posted by Pete at the top of the thread. If 1st street is to the left then Classen must be on the bottom, and there isn't a sidewalk along it. So unless they are planning on just ripping it out and not replacing it, I'd like to believe it'll still be there after the construction is complete. It could just be sloppy renderings. Yeah, that looks like a big fail if there's no sidewalk on Classen. And really at this point, OKC should have learned its lesson. Buildings don't just need sidewalks, but ones that encourage walkability. Any sidewalk off Classen should have some space between the sidewalk and the street and hopefully there are some trees in between to increase pedestrian safety. Pages 12 & 13 show the approved site design. I've noticed that the images for projects at the top of the threads are usually the very first images of a project and the final designs are often much different than what is initially shown. Thanks for taking the effort to update. This area is changing so fast it will soon be unrecognizable. Yes, including our version of the Parthenon! Excellent, thank you for doing the research. My pleasure. Proper sidewalks are going to be so important for Classen.